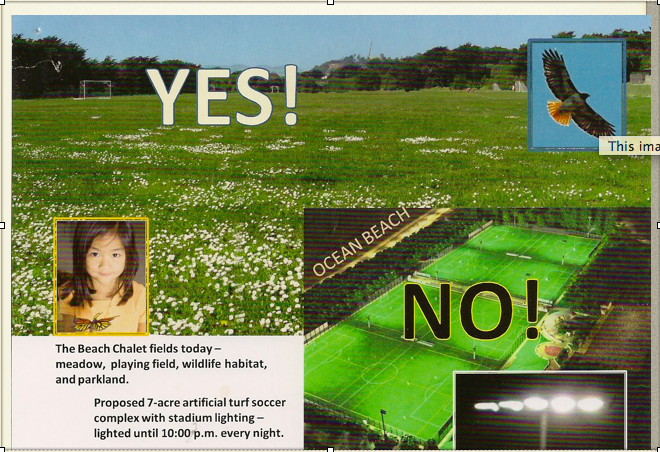 Information against San Francisco Recreation and Parks’ plan to build a stadium with artificial turf and 60 ft poles with 150,000 watts of lighting every night — in what is supposed to be the wild, undeveloped Western portion of Golden Gate Park, by Ocean Beach. Send a note to SF Supervisors and the SF Department of Rec & Parks — against the plan to change the nature of the Beach Chalet soccer field. The plan by Rec & Parks changes the very nature of the Western Edge of the park: it turns the natural soccer fields into a plastic field of artificial turf — and blights the tranquil Ocean Beach nightscape with the reflected glare of artificial lights. If the city needs a facility of this kind, it seems it should be located outside of the natural oasis that is Golden Gate Park. Please help keep the natural aesthetic of the park: send a note to your city supervisor — to vote against Rec & Parks’s plan for the Beach Chalet soccer field. Re: The Friends of the Urban Forest’s idea to water the street trees using a plastic bag inside the tree container, with holds to drip water. Ok, so we scraped this idea after the first watering. Second time, the holes for water got stuck under folds of plastic and no water came out. Then, when tugging on the bag, it tore open the hole and water poured out. So these 20 gallon plastic trash cans from the local hardware store work great. Two nail holes — and the cans hold the same amount of water as the two fillings from the tree containers. Around 2001, San Francisco passed an ordinance that prohibits anyone from paving the front yard. At least 20% of the front must be not-paved and set aside for landscaping of some kind (including stuff like ornamental rocks). The idea was to prevent people from paving their yard so they could use it as a parking lot, and to help keep water draining into the ground rather than into the sewers. Parking cars is prohibited on unpaved lawns; there is some discussion about whether or not cars are allowed to be parked on paved front yards. The ordinance about paving applies to all concrete or projects since the ordinance was passed. So, if a property has new-looking concrete (from about 5 years or newer), the owner is expected to have complied with the ordinance — or will have to adjust accordingly (meaning: dig up the concrete to comply). Another part of the city code prevents paving 200 square feet or more of any part of a property without a permit, because it is harmful to water runoff. Instead of being absorbed into the soil, the rain or water runs into the storm drains — and into the sewer system. Below are notes related to the ordinances, as well as the San Francisco Planning and Zoning Department and the Department of Building Inspection — the departments responsible for compliance and complaints. Sec. 132(g) Landscaping. All front setback areas required by this Section 132 shall be appropriately landscaped, and in every case not less than 20 percent of the required setback area shall be unpaved and devoted to plant material. Planning Code, Sec. 132(f) Permitted Obstructions. Only those obstructions specified in Section 136 of this Code shall be permitted in a required front setback area, and no other obstruction shall be constructed, placed or maintained within any such area. No motor vehicle, trailer, boat or other vehicle shall be parked or stored within any such area, except as specified in Section 136. Planning Sec. 133(d) Only those obstructions specified in Section 136 of this Code shall be permitted in a required side yard, and no other obstruction shall be constructed, placed or maintained within any such yard. No motor vehicle, trailer, boat or other vehicle shall be parked or stored within any such yard, except as specified in Section 136. 1.General. It shall be unlawful for any per-son, firm or corporation to commence or proceed with the construction of an impervious surface in a front yard setback area, other than a driveway as defined in the Planning Code Section 136(a)(30), unless a permit is first obtained. See Section 110, Table 1-F – Specialty Permit Fees – for applicable fee. 2.Referral to Planning Department. The Department shall refer all applications for a permit pursuant to this section to the Planning Department for a determination regarding the proposed construction’s compliance with Sections 132(g) and 136(a)(30) of the Planning Code. The Department may not issue the permit unless Planning determines the proposed construction to be compliant. 3.Penalty for violation. Any person, firm or corporation violating the provisions of this Section 106.1.14 shall be guilty of an infraction. Every violation determined to be an infraction is punish-able by (1) a fine not exceeding $100 for a first violation, (2) a fine not exceeding $200 for a second violation within one year, and (3) a fine not exceeding $500 for a third violation within one year. You might be eligible for a reduction in your sewer rates — contact the San Francisco Public Utilities Commission, High Consumption Unit at (415) 551-4780. You’ll be asking for a reduction in the “flow factor” for the sewer. They’ll send you a form to fill out and have an inspector visit your home. If you aren’t happy with the outcome, you can file an appeal and make your argument for a reduction in rates in person before the community board. I did this once and was successful in getting our flow factor rate reduced. It helped to have a table listing the water usage over the years — which showed heavier water usage during the months with no rain. Photos of the garden also helped. In May 2008 we worked with neighbors and friends to plant trees in the Outer Sunset of San Francisco.